As you may have noticed my posts have not been too regular recently, due to my moving house and ending up with no broadband for the past few weeks, meaning I couldn't upload any songs. It took a while but I have managed to upload this, the brand new single by Darren Hayes (out 31st October - Hallowe'en! ), although it's just a yousendit. The song is one of two brand new tracks on the forthcoming Savage Garden greatest hits album (out 7th November), and was produced by one of the producers behind 2 of my favourite albums of the past 2 years, whose belonging to Gavin Degraw and Maroon 5. The song is, as always with Darren's ballads, absolutely lovely. On the first lesson I thought it was nice, but on the second I loved it and it's been implanted in my brain ever since. Of Darren's other songs it most reminds me of Like It Or Not from Spin, which is a lovely song already but this is even better. It would be nice if it was a big hit but as usual with the bands I post here who are releasing in the UK, you can never count on it. However, I do think the greatest hits album is going to do very well and I look forward to any publicity that Darren does to promote the single and the album. I'd love if it did so well they decided to reform! Now that the Faders are well & truly finished, it's the Lovebites turn to attempt to become the female Busted. After first seeing a photo of them, I was dubious. They're certainly not as glamorous and professional looking as Girls Aloud, but looking at the other successful girl groups of the past few years, this may, surprisingly, be more of a help than a hinderance. The Spice Girls are the main example - when they started they were anything but polished, but they were real. Not real in a "from the streets" way, just ordinary, fun-loving young girls. Busted had the same vibe, and I've always thought this was the key to their success. You Broke My Heart isn't technically as good a song as No Sleep Tonight. The lyrics are rubbish, but realistic - they're just what any teenage girl would write, and I think this will appeal more to girls than the beautiful, slim, designer-clothed, outwardly perfect female pop stars who are often submitted to the teen market. Perhaps even boys too in the same way that Busted appealed to girls - these are the kind of girls that teenage boys would love to date, because they're clearly up for a laugh and quite attainable. I don't know if I personally will ever be a huge fan - it really depends on the standard of the rest of their music, because my patience with British rocky pop music is generally limited, but I do think they have a chance of being huge. We'll just have to wait and see! Many of you will have heard of Lush, as they were one of the acest indie-pop groups of the 90s, but I think my younger readers deserve to know about them too. It took me a long time to 'get' Lush. It wasn't until I listened to this song on headphones that I could make out the lyrics and realise how brilliant they were, and a subtly sparkly pop tune soon revealed itself in it's full glory. The singer, luminous redhead Miki Berenyi's view of slimey self-loving men (for eg: "When you say you love me you're just flattering your vanity, but I don't need your practised lines, your school of charm mentality") is not only hilarious, but quite true. Lush were also proper pop stars, in the sense that they loved to party, wear flamboyant clothes and cause controversy, making them regulars in the mid-90s gossip pages. The song might take a few listens but once you get it, if you're anything like me, you will absolutely love this band. I posted about this US pop-rock boyband a few weeks ago and since then the buzz around them has been growing and growing - their single is currently at no.11 in the Billboard Hot 100 and no.8 on TRL. When I posted Pop Princess I thought it was their one-off piece of pure aceness, but I hadn't heard this, their joyous cover of Tiffany's I Think We're Alone Now! This song has been screaming out for a modern pop makeover for years and at last someone has given it a go. Their rockier style and maleness makes this version quite different to the original but it works perfectly, making a quite good band a great one. They're much prettier than McFly as well, so I hope their success continues! Back to normal on Into The Groove (not that posting Swedish music is anything but normal for this site) and I have a whole backlog of songs to post. First up is a song by an artist who has appeared on this blog twice before, for his brilliant single Superfabulous, featuring Rose McGowan (yes, she sings!) and Scott McCloud from Girls Against Boys,and the track The Force Of Gravity featuring JC Chasez. 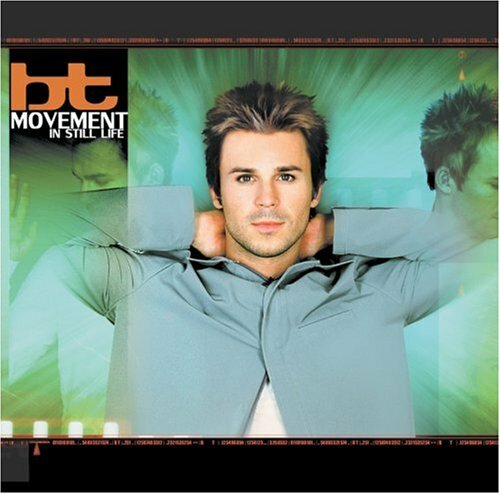 BT (aka Brian Transeau) is also known for producing the song from which my other blog's name was taken, Pop by *N Sync, as well as the soundtrack of the film Monster. He has made 9 albums, which means a wealth of great and varied material and this song (from the US version of his 2000 album, Movement In Still Life and also the UK release Still Life In Motion - confusing, I know!) certainly sounds different to the other BT songs I've posted. It could almost be described as indie or a rock ballad, but thanks to BT still has a great pop spin on it with great lyrics, addictive catchiness and plenty of dramatic sound effects. It actually sounds very much like something one of my favourite discoveries of last year, Freeform Five, would make. It's a shame (no pun intended) that BT is not more recognised as one of the very best producers of modern pop music. He even sings on this track himself - a very talented man indeed! Whenever I turned the radio on during my time in Sweden, I heard this song and soon I was walking around Gothenburg humming it - it just would not get out of my head! But it wasn't until I got home that I found out the singer and song title, and researched Joana to find that not only is the song normally a guitar-fuelled power ballad (it was made into a shimmering poppy dance track for the poptastic Swedes) but all her other songs are boring ballads too! I was very disappointed, but I guess having only one amazing song is better than an album full of mediocre ones. I wonder if she is related to the inventor of zimmer frames?